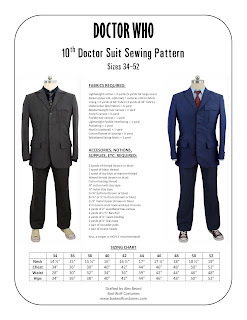 Doctor Who Costume Guide: 10th Doctor suit pattern, now shipping! My new (Bad Wolf Costumes) 10th Doctor suit pattern is now shipping! Thank you, everyone who pre-ordered! Free sewing tutorial (intended for use with this pattern) is coming soon, so stay tuned and subscribe to my "Costume Guide" e-mail newsletter (upper right corner) for updates!